China's first lunar rover is bound for the moon after launching Sunday (Dec. 1) on a mission that, if successful, will establish China as the third nation to soft land a spacecraft on Earth's natural satellite. Further, if all goes as planned, China's Chang'e 3 mission will mark the first time any spacecraft has made a soft landing on the moon since the former Soviet Union's Luna 24 unmanned mission in August 1976. The last of the Luna series of Soviet spacecraft, Luna 24 was the third and last lunar landing mission to follow the final U.S. visit to the moon’s surface on the manned Apollo 17 mission four years earlier. The Chang'e 3 lander and rover are expected to enter orbit around the moon Friday (Dec. 6) and then spend another week decelerating through six stages, lowering it to just 9 miles (15 km) above the surface, according to the state-run news agency Xinhua. Then on Dec. 14, the 8,400-pound (3,800-kg) four-legged lander will attempt a powered descent to the moon's Sinus Iridum, or Bay of Rainbows, autonomously navigating to a touchdown using onboard optical and microwave sensors. Once on the surface, the 310-pound (140-kg) six-wheeled rover will drive down a ramp from atop the lander to begin surveying its surroundings. The rover will be the first to explore the Bay of Rainbows, a plain of basaltic lava that was previously mapped by China's Chang'e 2 lunar orbiter in 2010. A Long March 3B rocket launches with China's 'Yutu' moon rover from the Xichang Satellite Launch Center, Dec. 1, 2013. On July 20, 1969, as astronauts Neil Armstrong and Buzz Aldrin were just hours from becoming the first men to land on the moon, NASA Mission Control in Houston called to the moonwalkers' crewmate Michael Collins with the day's news. "Among the large headlines concerning Apollo ... is one asking that you watch for a lovely girl with a big rabbit," Mission Control radioed. "An ancient legend says that a beautiful Chinese girl called Chang'e has been living there for 4,000 years." "You might also look for her companion, a large Chinese rabbit, who is easy to spot since he is always standing on his hind feet in the shade of a cinnamon tree," the Capcom (capsule communicator) added. "Okay," Collins replied from lunar orbit. "We'll keep a close eye out for the bunny girl." The Chang'e 3 rover was named "Yutu," or "Jade Rabbit," after the goddess' pet white rabbit of Chinese folklore. The name was chosen following a poll that sought ideas from Chinese citizens worldwide. "Yutu is a symbol of kindness, purity and agility, and is identical to the moon rover in outlook and connotation." Li Benzheng, the deputy chief of China's moon program said. "Yutu also reflects China's peaceful use of space." Built to collect data about the moon's geological structure and subsurface composition, the Yutu rover is also tasked with seeking out natural resources, according to Xinhua. The 5-foot tall (1.5 meter) rover is equipped with a camera, two spectrometers and a radar unit powered by two solar arrays. 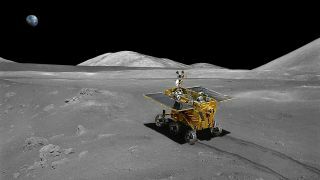 Yutu is also outfitted with radioisotope heaters to warm the rover over the lunar nights. Chang'e 3 is the third of China's missions to the moon and the second "step" in the nation's plans for unmanned lunar exploration, leading to the return of samples to Earth. Chang'e-1 was launched in October 2007 on a mission to collect three-dimensional images of the lunar surface from orbit, as well as gather data on the chemical makeup of the moon and the distribution of resources. The reported landing zone for Chang'e 3 mission, the Bay of Rainbows. The lander will deploy a heavily instrumented rover to reconnoiter the area. China's maiden mission to the moon ended in March 2009 when the orbiter impacted the surface. Chang'e 2 built upon the success of its predecessor, while preparing China for its first mission to land on the moon. Launched in October 2010, the orbiter mapped potential landing sites for the rover before leaving the moon for the Earth-Sun Lagrangian-2 point, testing the Chinese tracking and control network. Chang'e 2 then conducted a flyby of asteroid Toutatis in December 2012, establishing China as the fourth nation to explore an asteroid and further testing the country's deep space tracking systems. The Chang'e 3 mission comes 10 years after China's first human spaceflight, Shenzhou 5 in October 2003. Currently focused on deploying a space stationinto Earth orbit by 2020, China's long range crewed spaceflight goals include landing astronauts ("taikonauts") on the moon.